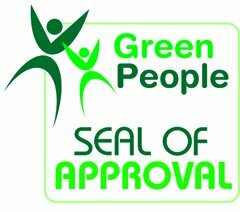 What GreenPeople Seal of Approval Means for Consumers? “Green” consumers want products that are truly sustainable, holistic, and eco-friendly. Green businesses want to reach consumers interested in lifestyles of health and sustainability. But how do eco-friendly consumers and sustainable businesses find the products they need? Since 1998, the GreenPeople Directory has helped consumers and green businesses connect. Our goal is to guide people through a crowded marketplace to find green, eco-friendly and healthy products and services. We help consumers, investors and businesses to harness their economic power to promote environmental sustainability. All products and services in our directory have undergone a Green Assessment, and have been checked against stringent eco-criteria. We examine ingredients, supply sources, organic or other certifications, and the effect the product or service has on consumers and the environment. If products or services submitted to GreenPeople meet the criteria,* that business becomes eligible for inclusion in our directory. We award that business our “Green People Seal of Approval,” and display it in their directory listing. We also encourage the business to display it on their site, conveying to the public that their products are indeed natural, organic, green, eco-friendly, and healthy. Taking workers, customers, and communities, as well as the environment into account when making decisions. We are proud to support our member businesses! Please contact members of our directory with confidence that their goods and services are green, eco friendly, healthy and sustainable. If your business has already been evaluated and approved, you may display the GreenPeople Seal of Approval on your website. Please choose an option from the images below. We appreciate your interest in the GreenPeople Directory of green goods and services! Together, we are working to grow a greener and more compassionate world. We’re proud of what we’ve been able to do and we cannot do it without you!